If your parents or other senior loved ones are struggling with memory loss, Alzheimer’s disease, or another form of dementia, a memory care facility may be the best option for their health and safety. Finding a long-term care in the Phoenix area is an overwhelming process at times. At Above And Beyond, we strive to take the frustration and guesswork out of the process so you can be sure your senior loved ones are well cared for. Assisted living facilities often have memory care units on the premises, but not all do and they don’t all offer the same treatments and services. Memory care facilities are distinctly different than assisted living facilities. 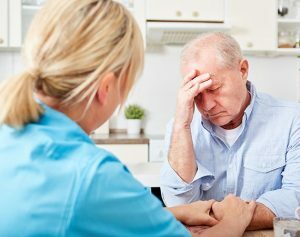 If your loved one is in a memory care facility, he or she will benefit from long-term skilled nursing that is specifically geared toward patients with Alzheimer’s, dementia, and other memory problems. Your loved one will have 24-hour supervised care in a separate wing, floor, or even building of a facility. Even the physical layout of the location is designed to help those with memory loss; the design minimizes wandering and the building is easy to navigate. Recreational activities are also specifically designed for residents who have Alzheimer’s or dementia. Memory loss affects everyone differently, and everyone with memory loss can have varied needs as a result. Above And Beyond offers free senior placement services, including for patients with impaired memories, and we get to know your loved one’s individual needs. When you need memory care or dementia care in the Scottsdale or Phoenix areas, or are interested in learning more about other long-term care facility options, Above And Beyond can help. Learn more about our placement services and schedule a consultation when you’re ready to take the next steps. We understand everything sounds and feels overwhelming. Making the decision to find care for your family member is never easy. We are always here for you. Please give us a call today with any questions or to schedule an appointment.